Creamy feta, rustic parmesan, and spinach are layered in between delicate pieces of filo pastry, to make this super Easy Homemade Spinach Spanakopita. 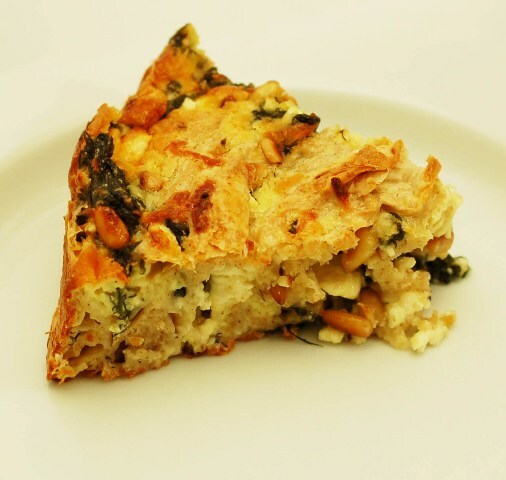 Our friend, Nanette, posed a recipe for an easy peasy” Spanakopita a couple weeks ago. I trust Nanette, but could this really be “easy peasy”? Ever since reading her post I have been itching to make this recipe. I finally had time this weekend. I don’t like to copy a recipe exactly when I am going to post it so I added a few extra changes to this dish, like toasted pine nuts and some shallots. I was amazed at how easy this recipe was. I literally had dinner on the table in less than an hour so yes, it was incredibly “easy peasy”! Preheat the oven to 400F. Grease a round baking dish with some olive oil and set aside. Heat olive oil in a pan and add the spinach, cook until wilted. I then took a pair of kitchen scissors and cut up. Lower heat, add garlic, shallots, and dill, cook over low heat for about 3 – 5 minutes. Allow to cool. Add the cheeses and the pine nuts. Season with kosher salt. Lay a couple of sheets of filo pastry on top of each other and then scatter a little of the spinach mixture. Scrunch the pastry up and place into your baking dish. Repeat until you have used all of your spinach mixture and the baking dish is full. Beat the cream and eggs together and gently pour the mixture the filo being sure to evenly cover the top. Allow the pie to rest for 5-10 minutes. 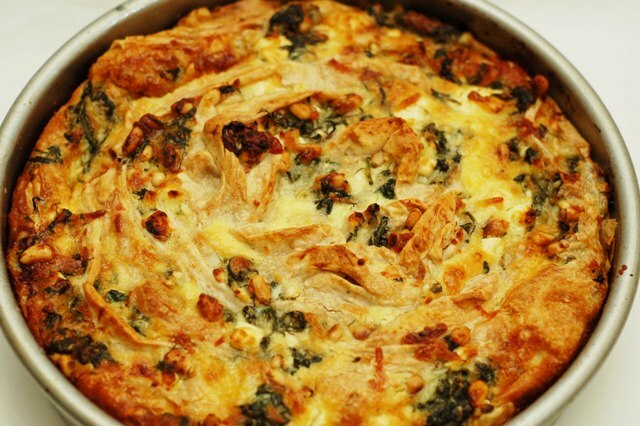 8 Responses to "Easy Homemade Spinach Spanakopita"
Does this look delicious or what? I love the rustic look - it's incredibly appetizing. I never knew there was such a thing as whole wheat feta. I definitely have to try this recipe. I did not know about ww filo. Thank you for sharing and I love this recipe; how appealing to look at and the dish sounds delicious! I have to make this! This is one of my partners' favorite things in the world. It reminds him of when he was a kid and his mom would make these small spanakopita parcels for him to eat... I think he'll be thrilled. Thanks for posting this, it looks wonderful! Ah yes...Nan's Spanakopita has appeared again! Glad you enjoyed this Greek fave. Mmmm... never had it made this way, but I must try for I'm a huge fan of spanakopita plus, it looks a lot easier to make than the one I know! Thanks for sharing!